Damp-Cure injection cream in now available in a 8 litre DPC Cream Refill Pack for Builders. Twistfix are pleased to announce the launch of their BBA Approved Damp Proof Cream in the handy bag in a box packaging. The cost effective refill pack is specifically designed for builders undertaking regular damp proofing treatment or those installing a damp course system to larger buildings. Damp-Cure is a unique silicone emulsion cream formulated for injection into the mortar beds of of brick, block or stone walls to control of rising dampness. Damp-Cure can be used in all types of masonry and is quick, clean and easy to inject without the use of specialist equipment. The cream is dispensed into a series of holes drilled into the mortar course. From here it migrates rapidly into the masonry pores where the injection cream reverts to a liquid phase and polysiloxanes are formed in situ.­ During the curing period a low molecular-weight silane vapour is also produced giving excellent migration through the wall. Curing of the DPC starts immediately with the final cure taking 2 - 6 weeks depending on wall thickness. BBA testing and extensive field use with DPC injection cream technology demonstrates that Damp-Cure forms an effective damp proof course to treat rising damp. 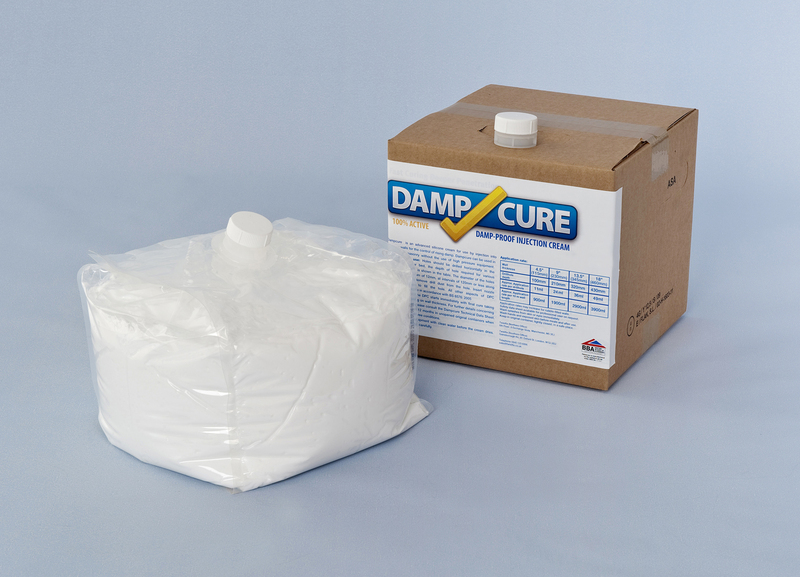 Damp-Cure can now be purchased in the following sizes: 8 litre bag in box, 3 litres tubs, 1 litre cartridge and 380ml cartridge. For more information about silicone damp proofing cream take a look at our PDF datasheet or contact us on 0800 123 6007, email info@twistfix.co.uk.